My name is Dr. Deborah Kauflin. 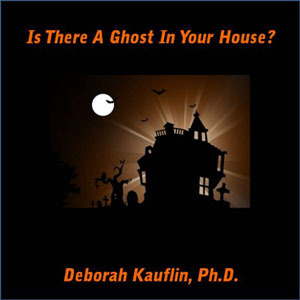 I am a paranormal researcher, psychic medium, and I worked as a criminal profiler for over 20 years. I worked for police on hundreds of serial murder cases and sexual homicide cases as a criminal profiler. I interviewed 25 serial killers and mass murderers, wrote three books on profiling serial killers & terrorists, and trained thousands of FBI agents, homicide detectives, US Military, State Attorney General investigators and other law enforcement. I have consulted to elected officials, and my criminology research appeared in the US Congressional Report. I am the only profiler to interview a large group of female serial killers, and I created their profiles which are used by police worldwide. I have appeared on Investigation Discovery, The Discovery Channel FoxNews, ABC, CNN and the Seoul Broadcasting System. For years I wrote for Psychology Today, and for over two decades I did work with parents of murdered children. Now I conduct research on the paranormal. I am interested in everything supernatural. From ghosts to aliens, I am fascinated by what is out there. Many of my articles are written in a tongue-in-cheek manner, at least in the titles. The reason? Get people’s attention so they read and start to question the paranormal instead of blindly accepting it or simply writing it off. Are ghost experiences simply our minds at work? Do environmental factors coupled with the brain produce poltergeist activity? Are there truly entities with us? Do aliens exist? Is there an afterlife? I am constantly looking for answers to these questions. I am like you. I want to find out what is going on. If you have had a paranormal experience or you simply want to learn more about this subject, then you are in the right place! Feel free to share your experiences as there is no judgment here. **Disclaimer: This blog is for entertainment purposes only. Deborah Kauflin is not to be used by you in place of any medical, psychological, social service, environmental, legal, tax or financial advice or diagnosis from qualified and licensed professionals in those fields. Deborah Kauflin will not be held liable for any damages resulting from the use of this website or as a result of any appointment, email, online chat, conversation, presentation with or from Deborah Kauflin, or any persons or events related thereto, and/or any actions or decisions that you may make as a result, including but not limited to, actual, incidental and/or consequential damages resulting from any claims resulting from any act or omission, negligence, fraudulent misrepresentation or otherwise, including but not limited to, personal injury, death, loss of income, stress (emotional or otherwise), errors or omissions, or otherwise.